A magazine releases a recording of a private meeting where Mitch McConnell's aides discuss how they can use Ashley Judd's bouts with depression against her. 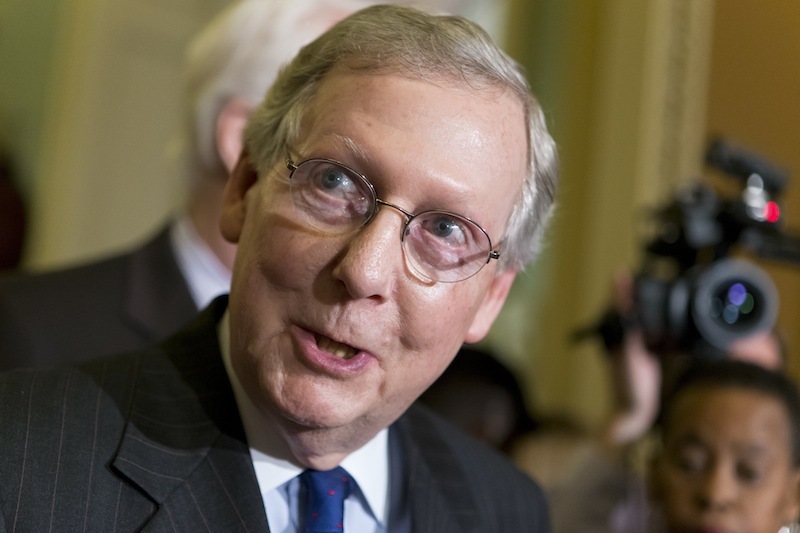 FRANKFORT, Ky. — Campaign aides to Senate Republican Leader Mitch McConnell proposed using actress Ashley Judd’s past bouts with depression against her if she had decided to challenge him in his re-election bid next year, according to a secret recording posted by a magazine. Mother Jones released a recording Tuesday along with an article about a private meeting in which the aides discussed opposition research into potential Democratic challengers. Aides talked and laughed on the recording about Judd’s political positions, religious beliefs and past bouts of depression. The FBI is looking into how the recording was made after the McConnell campaign accused opponents of engaging in “Watergate-era tactics.” The magazine reported that the recording was provided last week by a source who requested anonymity. Judd has been open about her bouts with depression. She spoke to the American Counseling Association’s national convention in Cincinnati in March, telling more than 3,000 counselors from across the country about her experiences. Her spokeswoman, Cara Tripicchio, criticized the McConnell campaign for considering making it a campaign issue. McConnell was asked several times at a news conference Tuesday about the propriety of attacking Judd over depression. He did not directly answer, but repeatedly brought up an incident last month, when Progress Kentucky tweeted an insensitive remark about his wife, former Labor Secretary Elaine Chao. The FBI confirmed that it was contacted by McConnell’s office and was looking into the matter. The magazine didn’t return a call seeking comment. The magazine reported the aides huddled on Feb. 2 in a private meeting to discuss potential Democratic opponents, including Judd and Kentucky Secretary of State Alison Lundergan Grimes. Grimes, a rising star within the Kentucky Democratic Party, hasn’t ruled herself out as a challenger. An unidentified aide said Judd had made a public statement as a Tennessee delegate to the Democratic national convention about her support of President Obama, an unpopular figure in Kentucky. The aide said that statement could be used against her and raised another issue: Judd lives in Tennessee, not Kentucky. In another instance, the aide played a recording of Judd talking about her evolving religious beliefs, which included native faith practices. The aides laugh loudly. An unidentified man then says “the people at Southeast Christian would take to the streets with pitchforks,” referring to an evangelical megachurch in Louisville. The magazine was the first to report about Republican Mitt Romney’s comments to donors paying $50,000 apiece to attend a private reception that 47 percent of Americans are dependent on government, see themselves as victims and believe the government has a responsibility to care for them. Romney’s critics used the video to argue that he was out of touch with average Americans during the last presidential campaign. Kentucky Democratic Party Chairman Dan Logsdon said the recording is telling about McConnell.